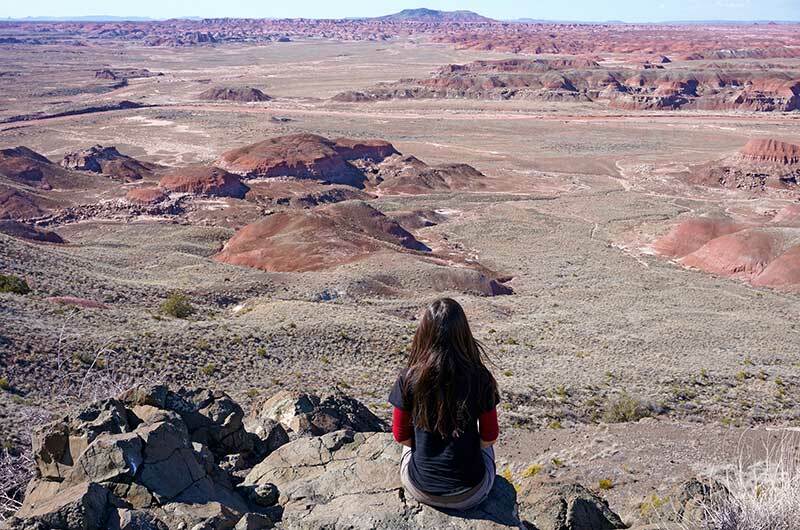 Thaneeya McArdle is an artist who, In October 2013, gave up most of her possessions to become a full-time nomad, as she traveled across the US and abroad. It was during her time on the road that Thaneeya landed a major licensing deal for her artwork. 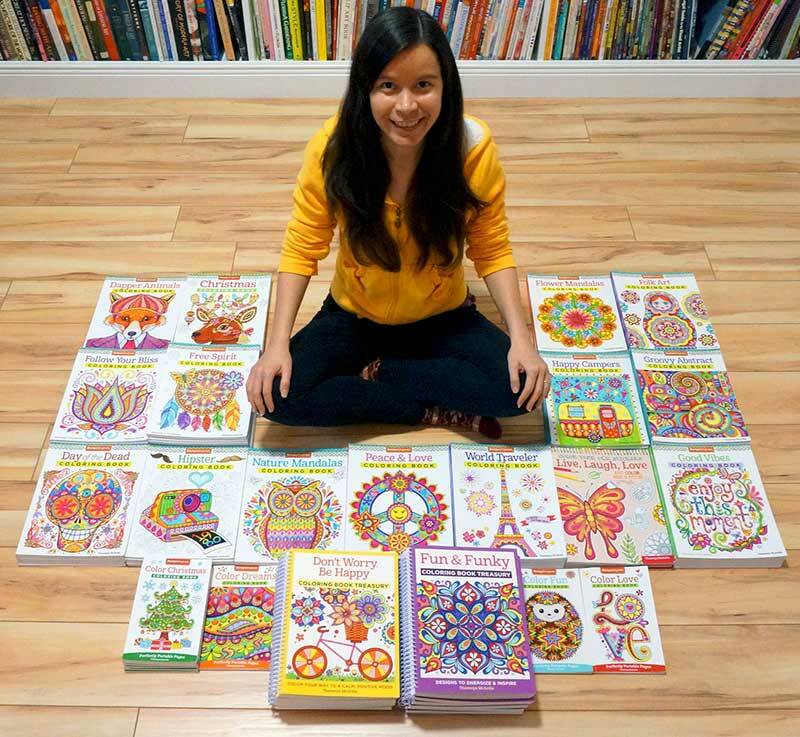 This guaranteed her two years of working remotely and managing her art for coloring books. Her coloring book empire continued to grow and she also manages a really fun site called Art is Fun. Thaneeya has returned home but is still open to getting back on the road. 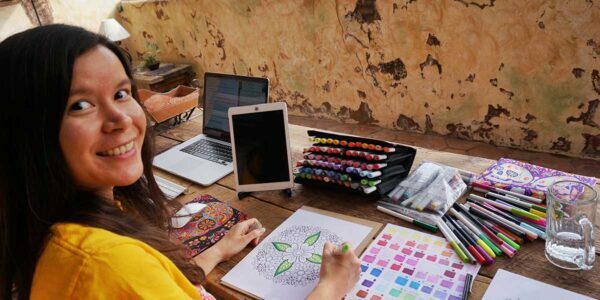 As we wait for her next steps, I threw some questions Thaneeya McArdle’s way about being a nomad artist and creator of coloring books. Thaneeya graciously took the time to answer. How did you manage your career while living as a nomad artist? It takes a fair amount of discipline to manage a full-time career while traveling. It was essential to have a good Internet connection everywhere we went so that I could easily communicate with my publishers, licensees, and licensing agents. Oftentimes opportunities pop up at the last minute (with short deadlines) so the ability to respond quickly was a real must! Balancing work and travel was definitely tough at times. When I started my nomadic adventure, my work schedule was relatively relaxed, but after a few months, I became swamped with projects. It was definitely a “good problem” to have for any creative entrepreneur, so I embraced it. At that point, being too busy did make it difficult to maintain a true work-life balance while traveling full-time. The allure of being in a new destination was sometimes dampened by looming deadlines. Instead of exploring, I had to stay inside and work. That’s not to say it was all work and no play though! When I did take time off to explore, I appreciated it all the more, relishing the sights and experiences unique to each place. For example, one of my favorite memories is of dancing on gypsum sand dunes at White Sands National Monument on a cold and windy day with hardly anyone else around. If my schedule had allowed it, we could have visited the park on a day with better weather, but it would have been packed with people, which would have changed the ambiance. Instead, I now have vivid memories of sand whipping around my ankles in the biting cold, watching the flow of loose sand glide over the dunes, and enjoying ample photo opportunities without other tourists in the background. Why did you want to become a nomad artist? I’ve had the travel bug my entire life. I love the feeling of freedom and anonymity that comes with exploring a new city where no one knows you, nothing is familiar and your entire schedule is thrown out the window. The world is endlessly fascinating, with such a rich diversity of places, cultures, and ways of living. I see travel as a process of discovery as the foreign becomes familiar. My husband Marcus is also a travel buff. 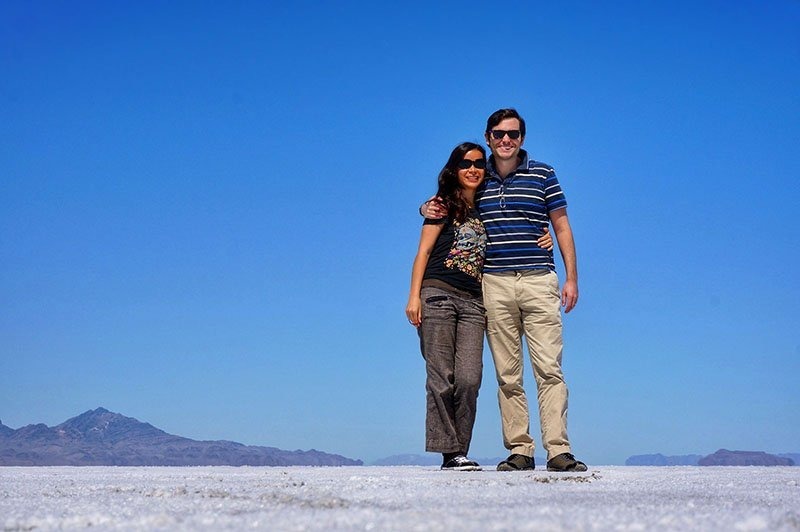 The year we got married we spent three and a half months in Europe and when our trip ended, we vowed to prioritize future travel as much as our schedules and income would allow. 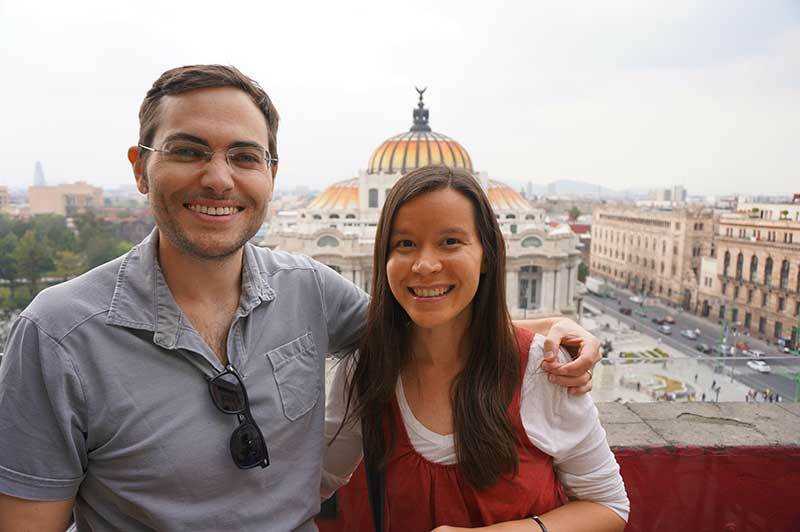 We always wondered what it would be like to travel full-time. One day when all the cards fell into place, we donated most of our possessions to charity, put the rest in storage, and embarked on a whirlwind two years of nomadic living! Where is home now? Why did you decide to come home? Funnily enough, I’ve traveled around the world and ended up buying a house in Florida, just 90 minutes from where I grew up. As our work schedule grew more intense, we realized we would be more productive if we had a stable work environment, without the stress of wondering how strong the Internet would be at our next location, without having to work at the dining room table, without feeling like we were “missing out” by being in a new place without proper time to explore. We came to the realization that separating our work from travel would result in higher productivity while working and more enjoyment while traveling. 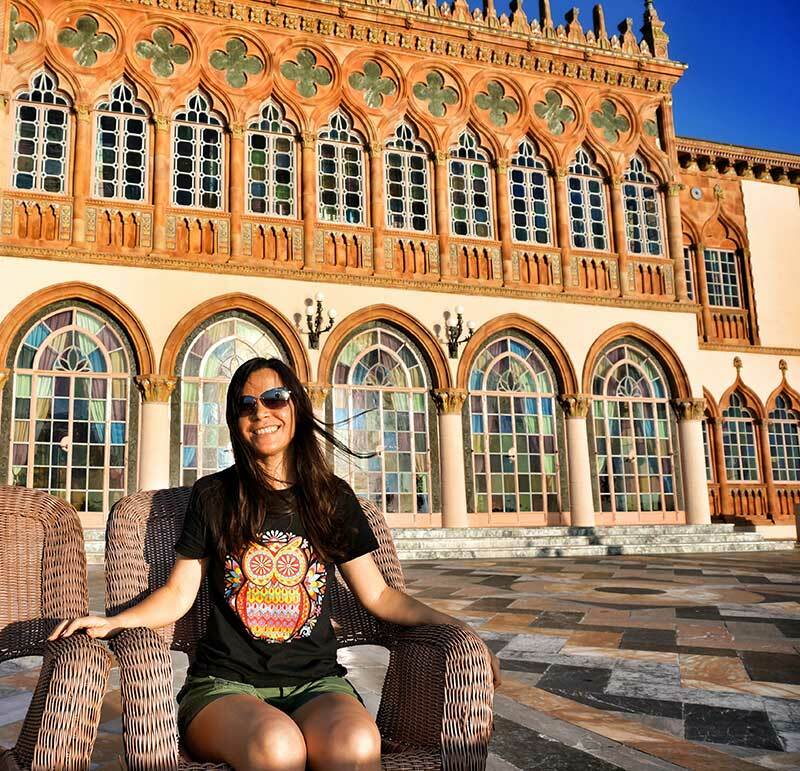 We chose Florida for a few reasons—mainly affordability, familiarity, friends, and family. 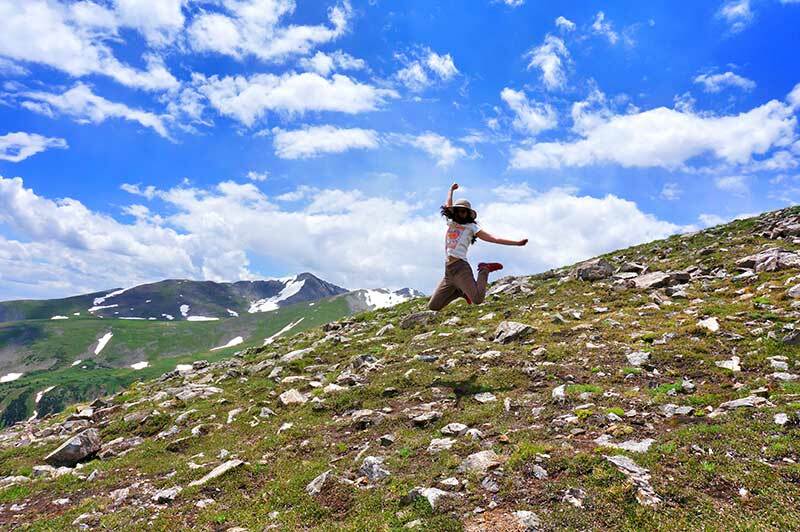 Who did you look to for inspiration as a full-time traveler? Before I became a full-time traveler, I subscribed to a few travel blogs to read about other people’s experiences pursuing the nomadic lifestyle. It was so inspiring just to know that this type of lifestyle was possible. I also enjoyed reading travel memoirs by writers such as Pico Iyer, David Yeadon, Phil Cousineau, and Rick Steves. These days I spend most of my time creating art for publishing and licensing. Specifically, coloring books and calendars. It keeps me busy! Once I’ve completed all my deadlines for this year I hope to create some video tutorials to demonstrate various art-making techniques, such as blending colored pencils, working with alcohol markers, drawing mandalas, etc. My husband has been brushing up on his video-making skills so he’ll be assisting me and doing all the video-editing. I also look forward to taking some time off to explore different media and subject matter in my artwork. It’s been ages since I had time to just “play” with art supplies, so I can’t wait for that! Any advice you’d have for someone who thinks they can’t become a nomad artist? Everything is possible! It’s all a matter of defining your goals, figuring out what steps you need to take to reach those goals, and then actually doing it. These days the Internet offers such a wealth of information from creative entrepreneurs and full-time nomads that explain techniques to hone your craft as well as how to make a living. Nowadays it’s possible to carve out your own niche that can earn you a decent income. Back when I was a Fine Arts student in college (in the early-mid 2000s), the only way to make a living as an artist was to get your work in galleries, apply for grants, or chance upon a wealthy patron. The Internet has changed all that, putting more control in the hands of the artist or entrepreneur. Also, remember that it takes hard work and discipline to succeed—there’s no way around it! With the right mindset and work ethic, you can achieve your dreams. Go for it! DISCLOSURE: I may be an affiliate for products that I recommend. If you purchase those items through my links I will earn a commission. You will not pay more when buying a product through my link. In fact, I oftentimes am able to negotiate a lower rate (or bonuses) not available elsewhere. Plus, when you order through my link, it helps me to continue to offer you lots of free stuff. Thank you for your support!